The White House press corps is acting like domesticated animals. 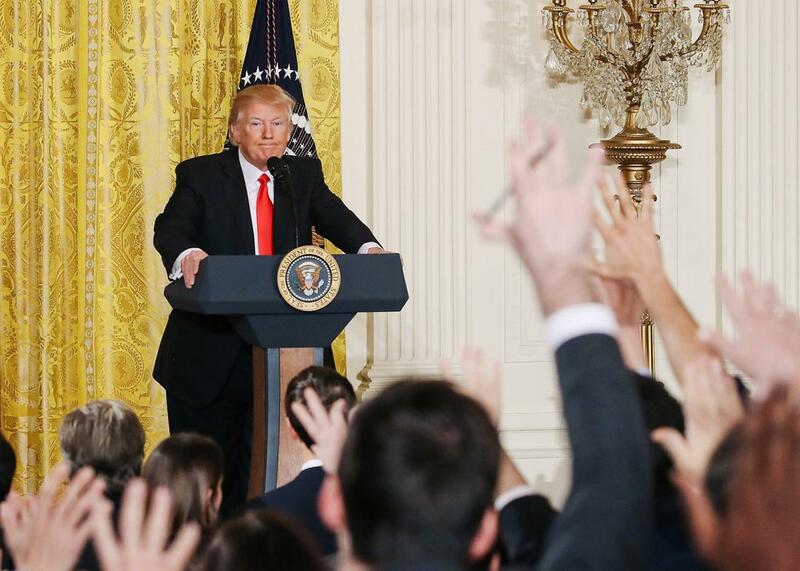 Trump is denying journalists their daily nibbles of process and collegiality, and it’s driving them crazy. President Donald Trump takes questions from reporters during a news conference in the East Room at the White House on Feb. 16. A week after election night, the White House press corps was already wringing its hands about threats to “our freedom of the press” and questioning the incoming administration’s “spirit of openness and transparency.” The reason? The president-elect went out to dinner without telling reporters. Reporters follow the commander in chief’s movements for good reason. And it is certainly alarming that members of the Trump administration have declared the media the “opposition party” and behaved in other ways that raise serious First Amendment concerns. But often, the noise coming from the Fourth Estate hasn’t been a high-minded defense of the freedom of press. It’s been the confused and frustrated baying of a domesticated animal unhappy with its new master. Domestication runs deep in our blood. Before humans discovered writing or agriculture or the wheel, we figured out how to make animals do our bidding. It was one of humanity’s earliest great discoveries. All it takes is a few scraps of food doled out at predictable intervals and a little bit of shelter, and we can convince wild, even ferocious, animals to do almost anything we want them to do. To the animals, it seems like a no-brainer of a deal. It is worth almost any price—free will, dignity, life itself—to forgo the red-in-tooth-and-claw competition for food and shelter in the wild. But even the most domesticated of pets will snarl when their owner stops providing sufficient nourishment or shelter. We’re such experts at domestication it’s surprising we can’t discern when we’ve undergone the process ourselves. But looking through the lens of domestication, it’s easy to see exactly why the White House press corps is so angry with the new president—what it’s reacting to and why. The true insults are not abridgements of First Amendment rights so much as the withholding of the perks and privileges to which the press covering the president has so long become accustomed. Trump threatened to kick the press out of its room in the White House. His flacks and surrogates hand out scraps of information grudgingly, infrequently, and beclouded by fragrant eructations of doublespeak. He breaks tradition by refusing to play with reporters on their turf. The press has reacted just as domesticated beasts denied their minimal needs would. Their angry barking became louder and more insistent, first in the form of grumpy asides, then open letters, and finally the big guns: snarky headlines. Trump’s monosyllabic grunts of disapproval (bad! Sad!) didn’t bring the press to heel, so he declared them an enemy—and treats all but the most obsequious reporters as such. And he’s starting to leave some of them out in the cold—arguably violating the First Amendment. President Trump is an exceptionally cruel master. But we shouldn’t forget that President Obama was an unkind one, too. Back then, the collar didn’t seem to chafe quite as much; despite repeated kicks and blows, the press corps seldom questioned the foundation of its relationship with the White House. Yet the past eight years have witnessed a dramatic decrease in reporters’ ability to get executive branch employees to say anything, thanks in part to flacks fluttering over every conversation to make sure that nothing substantial gets said. Reporters long used to supporting themselves on the already thin gruel of regular press briefings found that even in these executive branch–sponsored pseudo-events, there was less and less real information to be had; even the identities of the speakers were no longer fair game. Based on my analysis of briefings listed on the State Department’s website, in the first few months of the Obama administration, fewer than 20 percent of all State Department briefings were “on background”—with the speakers’ names off limits. By 2014, more than 90 percent of those briefings were on background. At the same time, Obama relentlessly hunted down leaks to the press with an alacrity not seen in the capital since Nixon’s plumbers gooned their way into the Watergate. And it was truly Nixonian for the Obama administration to order a monthslong covert operation to gather phone records from AP offices. Obama seemed determined, at all costs, to prevent any stray, unapproved bit of information from falling into the hands of the press. Yet the press corps still clung to the carefully cultivated illusion of intimacy with the real residents of the White House, laughing dutifully at his jokes at the smarmy White House Correspondents’ Association dinner. It took a president as mule-headed as Trump, one so daft as to openly declare a “running war” against the media rather than just conducting it covertly, to threaten the special relationship between the president and his press corps. But surely even the tamest of D.C. journalists understands what’s at stake if his owner isn’t delivering the access upon which he has become dependent. Perhaps the abused dog will finally awaken to the truth of his situation. And the truth for the journalist is this: The president and the class of people who wield political power in the District are your adversaries, not your friends. When you fraternize with them, when you date them, when you let them bloviate unchallenged in your forums and host your talk shows, when you dine with them at fancy black-tie dinners—you are numbing the reporter’s innate distrust of and antipathy toward rich, powerful people who, for better or for worse, impose their will on others. You think you are their best friends, just as dogs think they are man’s best friends. But as this president has so deftly proved, it is the domesticated reporter, not the feral one, who has so much to fear from the next few years. So it’s time, domesticated reporters, to go feral. Your abasement at the hands of the White House may be the best gift you’ve ever been given. You no longer need to sift through hours of invective from pasty, gum-gobbling propagandist Sean Spicer in hopes of finding a pearl of insight into the administration. You never again have to hunker down and wait for a pause in Kellyanne Conway’s Nebelwerfer barrage of screaming falsehoods. Now that you’re officially an enemy, you can spend your time fighting. Fighting for access to embarrassing documents. Battling to ensure that whistleblowers can have their voices heard. Waging a war that has already been underway for years—but that you were too comfortable to notice. You no longer have a choice. There is no longer a niche for the domesticated reporter. If you want to survive, go wild.